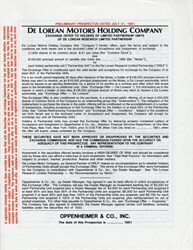 Original Red Herring Prospectus from the De Lorean Motors Holding Company issued in 1981. This was an exchange offer to the holders of the De Lorean limited partnership units. The prospectus is 112 pages of information about the company, manangement, history of the company, risk factors, financial information, and much more. This prospectus is extremely scarce. John DeLorean's sports car was a radical roadster with a stainless steel body and exotic gull-wing doors. DeLorean was an auto industry legend for designing the hotrod Pontiac GTO and for his fast rise through the ranks at General Motors. He quit GM in 1973 and later formed the DeLorean Motor Company. The DeLorean car debuted in 1981; by 1983 financial difficulties had doomed the company and it closed down after building fewer than 10,000 cars. John DeLorean was arrested in 1982 and charged with smuggling cocaine to raise money, though he was later acquitted after accusing the government of entrapment. The DeLorean car got a huge boost when it was driven by actor Michael J. Fox in the 1985 film Back to the Future. A red herring prospectus is issued to potential investors, but does not have complete particulars on the price of the securities offered and quantum of securities to be issued. The front page of the prospectus displays a bold red disclaimer stating that information in the prospectus is not complete and may be changed, and that the securities may not be sold until the registration statement, filed with the market regulator, is effective. Potential investors may not place buy orders for the security, based solely on the information contained within the preliminary prospectus. Those investors may, however, express an "indication of interest" in the offering, provided that they have received a copy of the red herring at least 48 hours prior to the public sale. After the registration statement becomes effective, and the stock is offered to the public, indications of interest may be converted to purchase orders, at the buyer's discretion. The final prospectus must then be promptly delivered to the buyer. History from StockResearch.pro (Professional Old Stock Certificate Research Service) and SavingsBonds.pro.